We are further solving the problems in one dimensional motion. We are here measuring the motion of the body considering only along one direction. 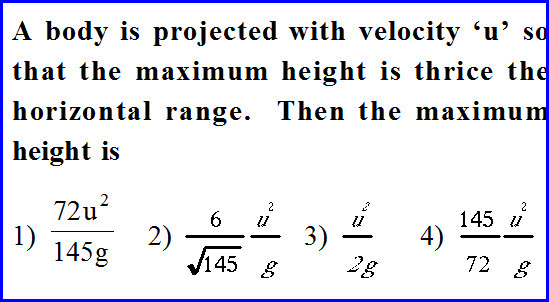 In the given problem a body is projected with a known velocity and it reaches a maximum height when thrown vertically up. 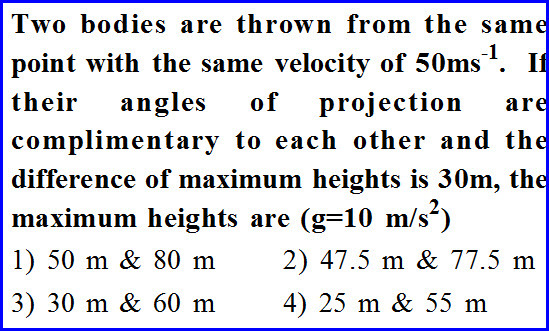 If the body is thrown with a same velocity and thrown with a known angle so that maximum height is three the range. We need to measure the maximum height of the problem. The problem is as shown in the diagram below. 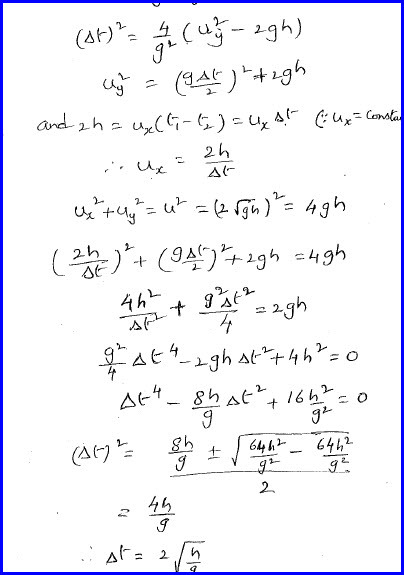 We can solve one dimensional problem, we can use four equations of motion. They can be used to find the relation among initial velocity, final velocity, acceleration, displacement and time. 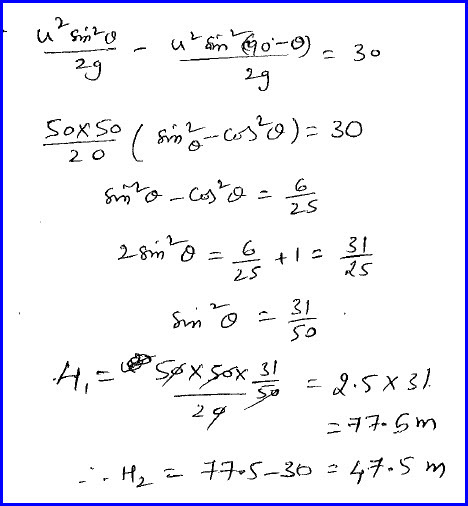 In the given problem maximum height and range relation is given. Maximum height is the vertical height reached by the body and range is the horizontal distance travelled by the body. By substituting the relation we can find the angle of the projection. By further using this value, we can find the maximum height as shown in the diagram below. In the given problem two bodies are thrown from the same point with the same velocity and it is given in the problem. It is further given that the angles are complimentary to each other. The difference between the maximum heights of the two projectile is given in the problem. We need to measure the maximum heights of the projectile. We know the equation for the maximum height and by putting the values given in the problem, we can find the value as shown in the diagram below. The angles are zero degree and ninety degree. 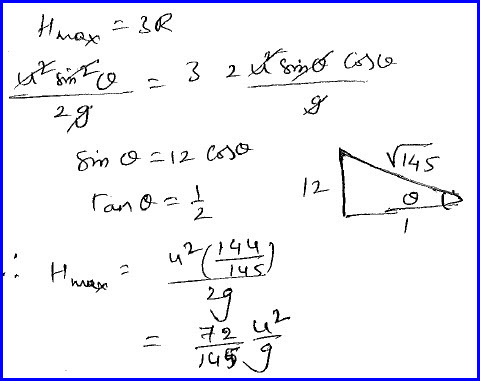 We can find the angle and then further substituting the value in the maximum height equation, we can find the values as shown in the diagram below. 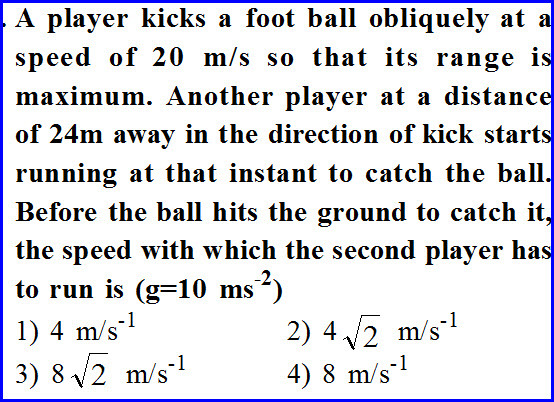 It is given in the problem, a player kicks a foot ball with an angle and the velocity of the projection is given in the data. There is another player at a certain distance and he started moving with the kick of the ball. The ball takes time of flight to reach the ground and the second person has the same time to catch the ball. We need to measure the constant speed with which the player has to run to catch the ball before it hits the ground. 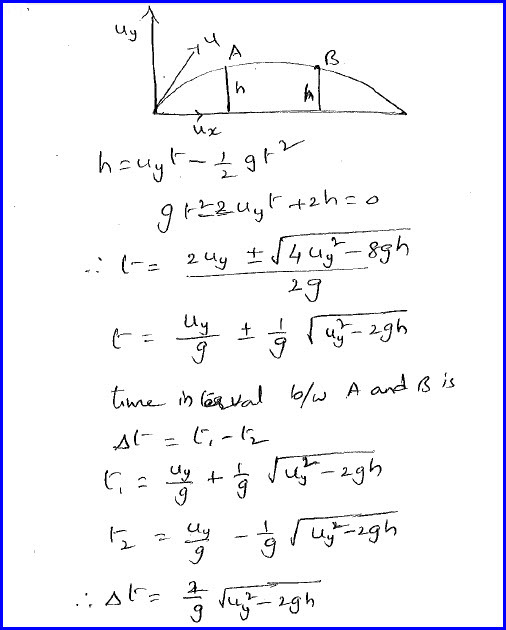 It is given in the problem that the body is projected with forty five degree angle so that the range becomes maximum.Its value is found to be 40 meter and the second player is at 24 meter. 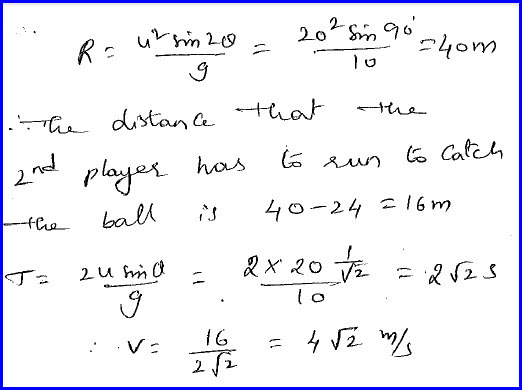 Thus he need to run the distance of 16 meter and he has to run to that distance with a constant velocity and he has the time similar to time of flight of the projectile. A body is projected with a known velocity so that it just clears two wall of equal height and the separation between the walls is given to us in the problem. 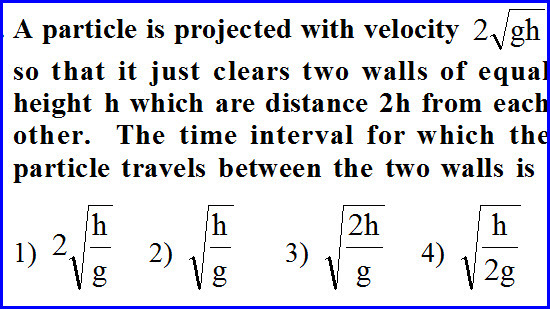 We need to measure the time interval between the two walls to cross. Height is the displacement along Y axis. Here we shall take the velocity only along that direction. We can write a two dimensional equation using the second equation of motion and write the equation of the time as shown in the diagram below. The equation has two solutions for the time and they are the times during which the stone cross the two walls. By writing the equation, we can solve the problem as shown in the diagram below. In the first part of the problem, we had found the difference between them. By simplifying them further, we can solve the problem as shown in the diagram below.